Volumetric labware is often used in a variety of experiments requiring different materials or styles. Hirschmann Class A Volumetric Flasks are designed in a variety of different models that each meet a different experimental requirement, but all flasks are manufactured to ASTM E288 Class A specifications. Different neck options are available depending on accessibility needs. Users can also choose a measuring flask with a high contrast red stripe to improve volume and measurement visibility. Amber glass is also available for experiments with light-sensitive media. All bottles come equipped with a stopper – glass, PE, or PTFE. American Society for Testing and Materials (ASTM) standards define the necessary tolerances for a volumetric flask to be labeled as Class A or Class B. The difference between the two is that Class A are defined to have higher accuracy and Class B are allowed to be less accurate. Hirschmann Class A Volumetric Flasks are, if nothing else, accurate up to ASTM standards. All measuring flasks are Class A ASTM according to ASTM E288 specifications and users can be sure that they will be audit-ready and working accurately with these volumetric flasks. All Hirschmann Class A Volumetric Flasks are labeled with fine white graduation lines and a marking spot so that users can easily identify, read, and measure volumes. The white color was chosen specifically to contrast strongly against the majority of laboratory liquids so that users would not need to struggle to read volumes. Furthermore, the large and easily accessible marking spot makes labeling of the measuring flask easy and practical. 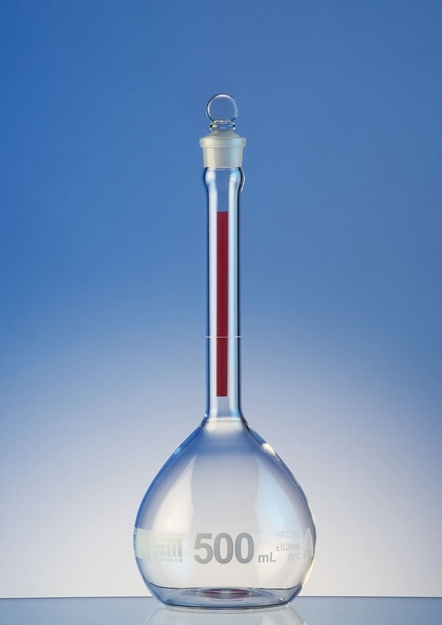 Hirschmann Class Volumetric Flasks with catalog #’s starting with “289” also include a red stripe on the neck that further allows users to identify volumes. Hirschmann has included a bottle stopper with everyone of their Class A Volumetric Flasks. Users can choose a bottle that includes their preference of a glass, PE, or PTFE stopper depending on what works best for their experiments. Hirschmann Class A Volumetric Flasks are available in amber glass for any users that need to work with light-sensitive materials. These measuring flasks are still made according to ASTM E288 Class A specifications and include a TS penny-head glass stopper with each bottle. Hirschmann Class A Volumetric Flasks are available in a wide variety of styles. All measuring flasks are constructed to ASTM E288 specifications. Users can select flasks with wide or narrow necks, with a red stripe or without, or an amber bottle if working with light sensitive media. Furthermore, all bottles are equipped with a stopper, options include: glass, PE, or PTFE. Bottles are labeled with fine white graduation lines and a marking spot. Hirschmann Class A Volumetric Flasks are also available in wide neck models for any users that might require easier access to the inner chamber or for users that would require faster dispensing out of the measuring flask. 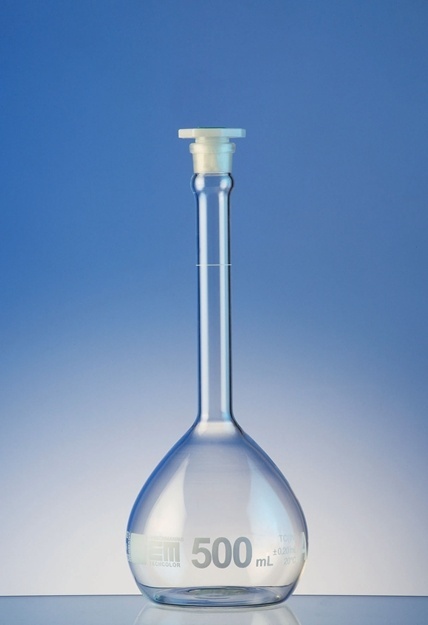 Wide neck volumetric flasks are still manufactured under ASTM E288 Class A specifications.